It’s been a while since I went to the Lissara Lodge and witnessed firsthand all the great work they were doing. I caught up with them recently and got a bunch of new pictures of the decorative deck railing to share. 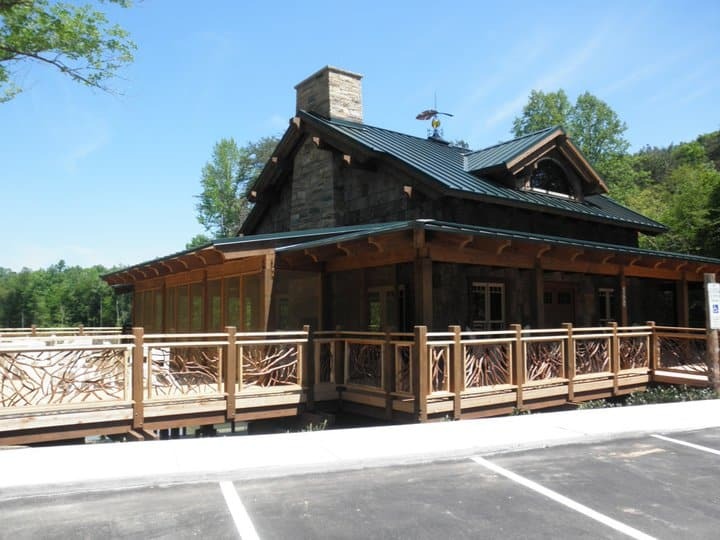 You’ll be amazed at the progress and impressed with how this decorative deck handrail enhances the overall look of the lodge and its outdoor entertainment space. Deck railing gives this project a finished and sophisticated look. Featuring sturdy branches in place of traditional spindles, this decorative deck railing enhances the landscape and adds to the lodge’s rustic but contemporary flair. Each knotty branch has its own shape, curvature and thickness which provides this handrail with a distinct look and charm. Carefully spaced, each panel helps to build a solid structure around the deck for both safety and security. Its open design however beautifully frames the picturesque views of the lake and scenes of nature all around. This video is from a while back, but it nicely captures the unique appeal about Mountain Laurel Handrails. On a rainy day like this, looking over the deck railings at the lake, the distinction between the deck and the lake slip away. See how the deck rails don’t move in spite of the heavy winds. Consequently, it would be quite relaxing to cozy up out here next to a warm fireplace while taking in these awe-inspiring views! This video shows how this outdoor space makes an outstanding retreat space no matter the season or what the weather is like. Who’s up for a nap? 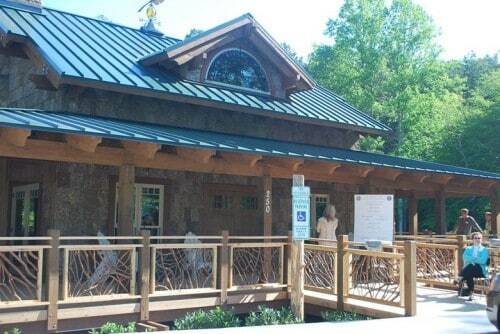 From this locale you can relax with views of the lake and trees. What a great place to meditate or practice a little yoga! Climb up the hill to get a more panoramic look at Lake at Lissara and its surroundings. You can also admire the beautiful and interesting architecture of the lodge from this spot. 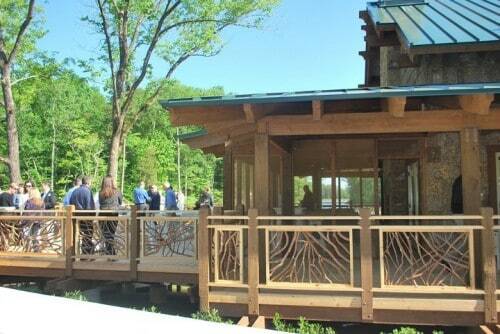 Look at how the deck and railings wrap around both the front and back of the lodge. Enjoy views from every angle of this property. I think this is a particularly nice picture of spring when the trees are full of foliage and the birds are chirping and flying all around. 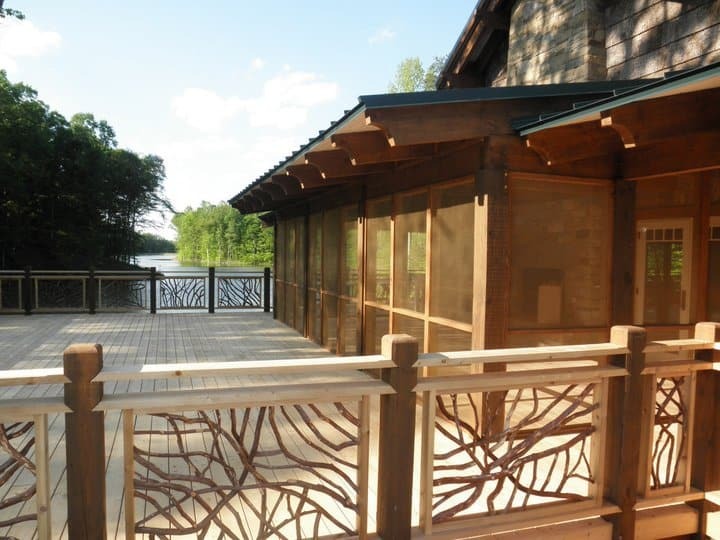 From here you can see how the decorative deck railing and all natural wood panels complement the building’s cabin like exterior and its woodsy surroundings. Its decorative deck railing design joins elegance with earthiness which makes for the perfect combination. Mountain Laurel Handrails blur the lines between the built and natural environments. Our goal is to make every deck look as though it is actually a part of nature. While standing on this deck you’ll feel like you’re in a tree house. It will seem as though you can reach out and touch the trees while you are experiencing the mist from the lake and the beauty of the clear skies. 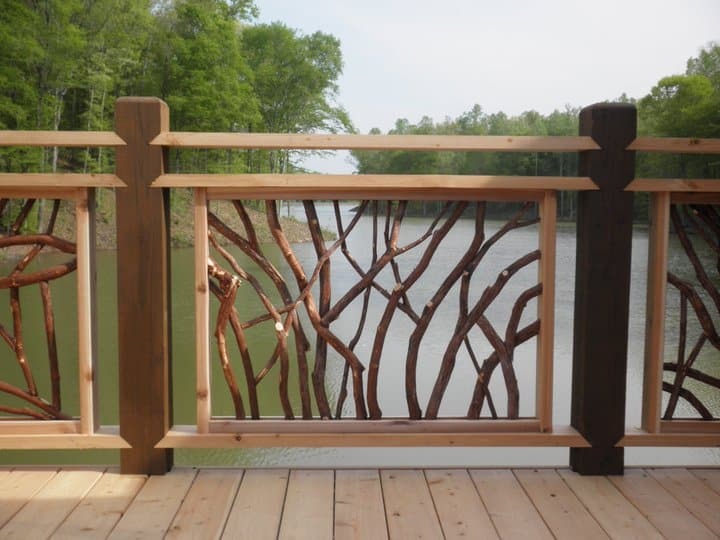 Its decorative deck railing inserts are made with all natural, tree materials to give it its delightful and down-home look. As we planned, these handrails like the deck look as though they are part of the natural landscape. Ornamental and creative, its natural tree balusters have warm amber hues that showcase its lovely wood grain and texture. It further gives this decorative deck handrail an organic and timeless feel. They also provide added security to the deck even when the winds are high. Our team has met and even exceeded building codes and regulations in the construction of this decorative deck handrail to ensure that is a safe place for all ages and physical abilities. 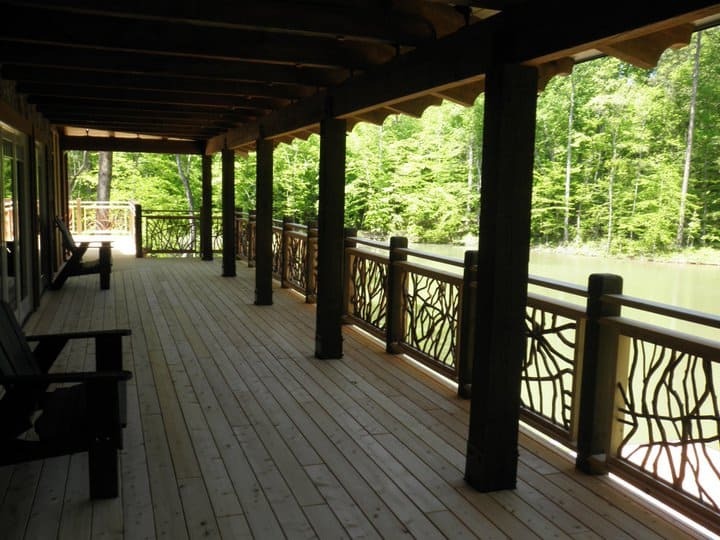 High quality with an artistic design, this custom decorative deck handrail transforms this deck into an amazing and relaxing place where guests can take in all of its surrounding views. This beautifully decorated deck expands the lodge by adding outdoor living space and creating an excellent place to entertain. 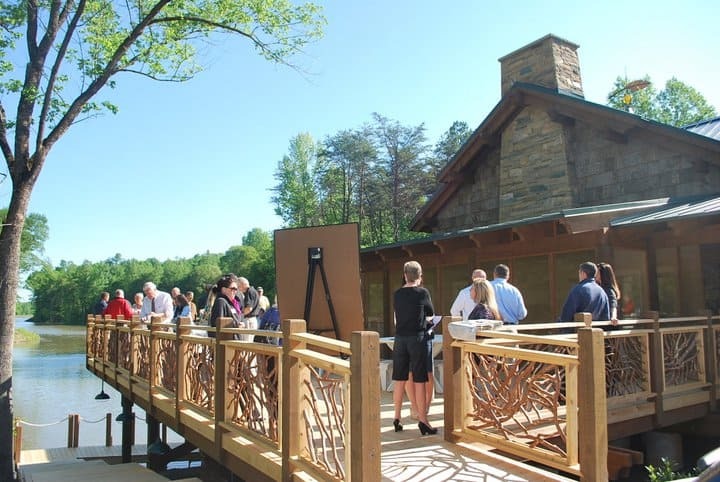 Keeping with the rustic theme, it is decorated with Adirondack chairs providing comfortable seating and a place to chat and catch up with friends. In the future LED deck lighting and a wood-burning fire pit can be added for a romantic and warm ambiance. Sitting on this decorated deck with its custom made handrails, you’ll feel like you’ve drifted to a far-away place. Its baluster are spaced perfectly for strength, safety and durability. Still, its open design and spacing does not take away from or hinder its views. What a photo opportunity! From here you can take pictures of the water, trees, birds and other wildlife. Rekindle memories of summer with these pictures of a party on the deck at the Lissara Lodge. Notice how all of the guests gather around the stunning deck handrails to safely and comfortably appreciate the glistening waters of Lake at Lissara and the beautiful Carolina Blue skies overlooking the lake! 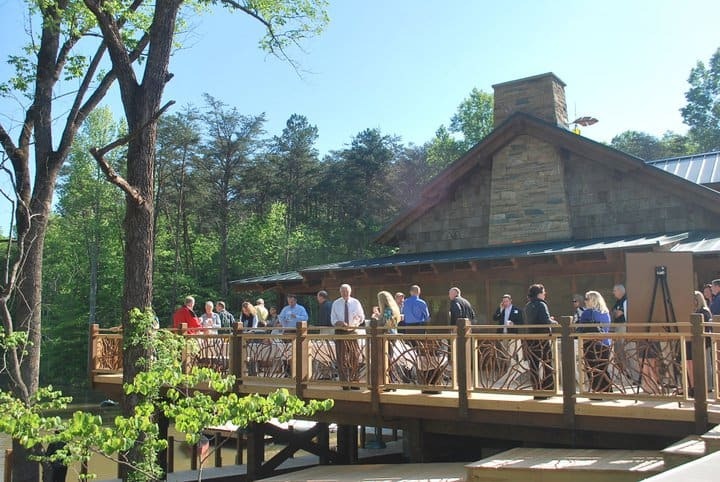 The deck and railings surround the entire lodge and provided plenty of party space. Its wooden construction is not only sturdy but it makes the space feel more inviting. Equipped with a wide entrance, guests were able to go on and off of the deck with ease. Everyone had a great time enjoying each other and all that Lake at Lissara had to offer. We are sure there will be another party here real soon. The Lake at Lissara opened up just in time for the Parade of Homes this past weekend. I’m sure that our decorative deck railings got lots of attention. 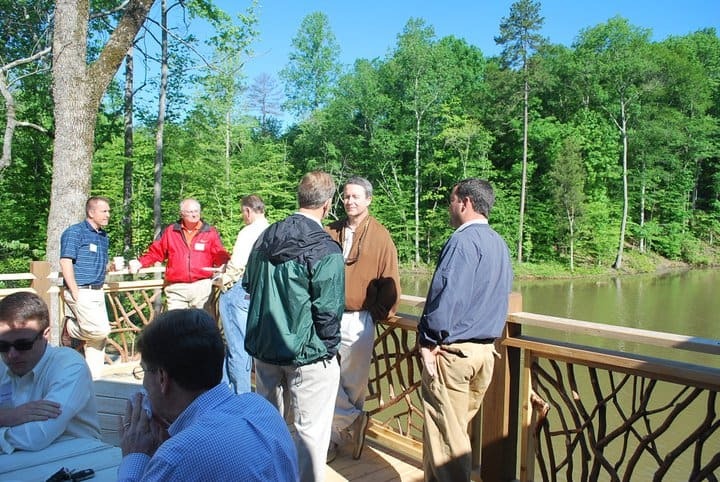 I know it’s been quiet over here… It’s because the wood railing artisans have been working on deck railing plans and crafting a project for the Lodge at The Lake at Lissara. This is going to be an incredible building in just a few short weeks. Ready to install handrail sections are going to be framed by a handrail design that is as unique as woven mountain laurel. Soon guests will spend the morning on this deck watching the sunrise while drinking a cup of coffee or sipping on a mimosa. In the evening guests can sit back while reading a book or enjoying an evening cocktail. There is a lot of work put in both by myself and the mastermind at Lissara in getting all the details right and ensuring that the finished product will be a perfect match for its creator, Bob Timberlake. 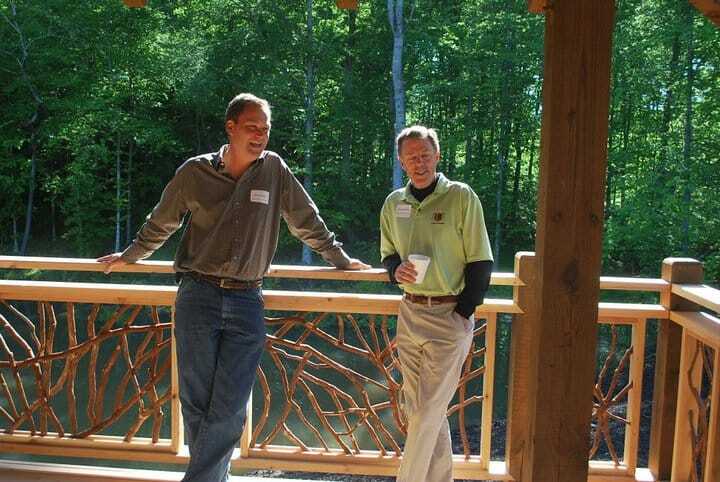 Our custom deck railing design incorporates smart design with functionality, charm and character. Crafted of natural materials, the deck also complements its metal roof and stone accented front. Made of top quality wood and crafted with a solid frame, this deck railing will stand the test of time. We have drawn up our plans for the railing frame which includes numerous details and specifications that make our vision come to life. 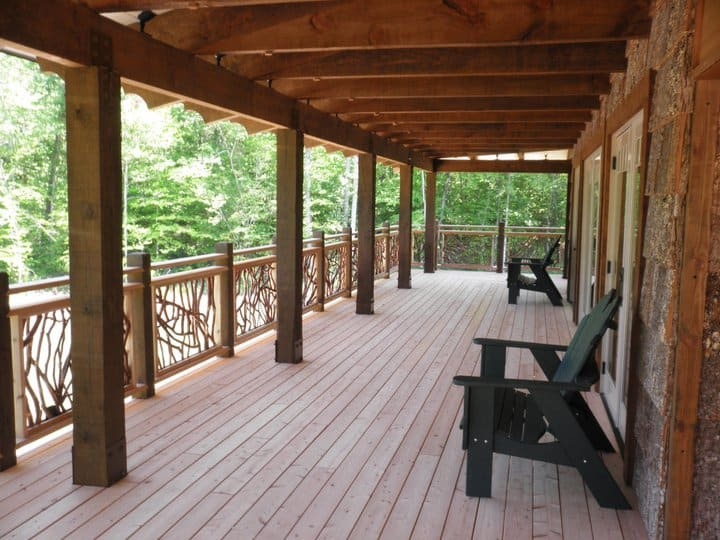 Our deck railing frame includes wooden posts and a solid rail system. Constructed of treated wood, the posts are attached to the frame to give it extreme strength and stability. With this frame, the deck will remain stable even when there are high winds or heavy rains. We let you in on the planning by showing you our architectural drawings and designs. 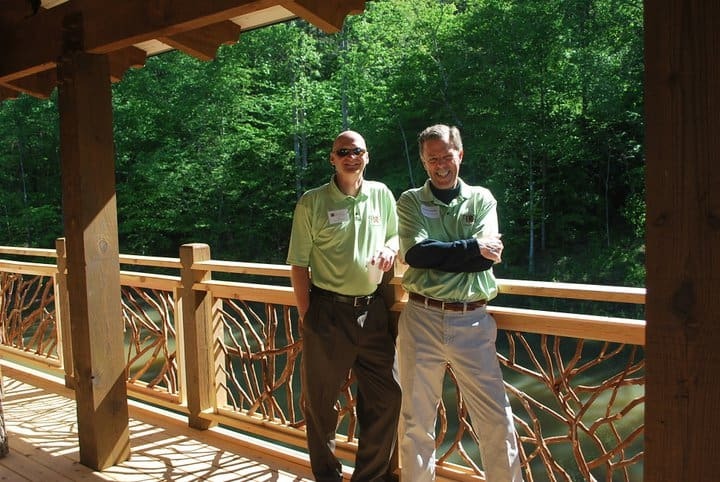 Now we will give you a look into the process of framing and building this decorative deck railing. It began with the delivery of our framed railing sections. Here it is! A photo of 225 linear feet of framed railing sections ready for delivery. They were packed like sardines into a moving truck to be driven to Mountain Laurel. Being the actual drivers, we were thrilled to finally get it here because rental moving trucks are no fun to drive. The truck we rented was unbearably loud because of road and wind noise. And at the end, our ears were ringing. Additionally, the steering was so bad you could hardly adjust the radio. But my whole mood changed when I got to check out the fabulous work that’s going on at the Lodge. The woodworkers there have built a beautiful timber great room that is ideal for social gatherings. Featuring huge 12″ x 22″ yellow pine beams, this room is cozy, warm and welcoming. Adding its rustic charm, its beams are made of yellow pine which brightens the room and brings a little of the outdoors indoors. Being the main ridge, these beams weighed a whopping 3000 pounds. 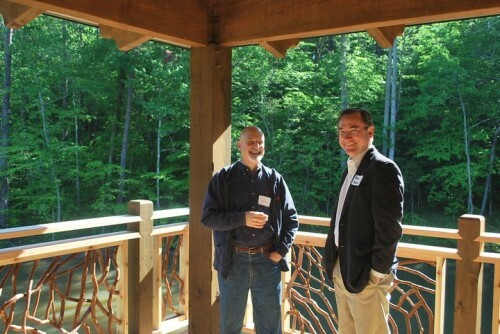 But it was well worth it when I got to check out the great work that’s going on at the Lodge. 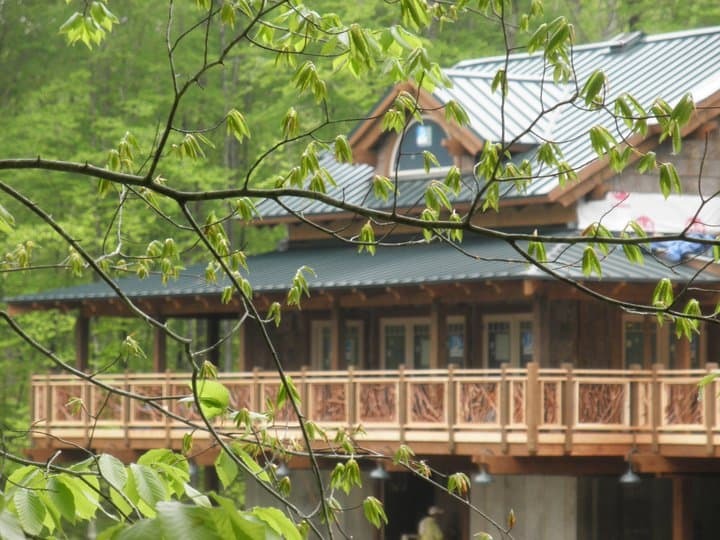 the woodworkers there have built a beautiful timber great room with a huge 12″ x 22″ yellow pine beam as the main ridge; it weighed 3000 pounds. The decking is cypress and the siding is of poplar bark. This is the view from across the lake that is more than a half mile long. The decking itself is cypress and the siding is of poplar bark. 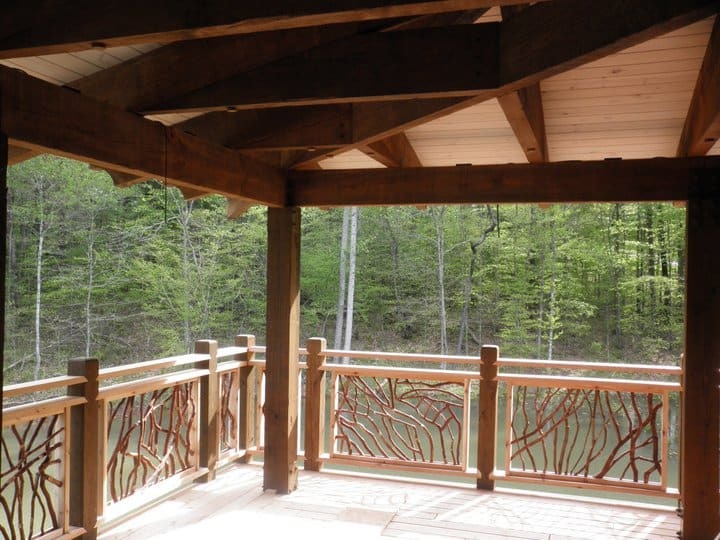 These sturdy materials will ensure this decorative deck railing is both attractive and strong for many decades to come. This is the view from across the lake that is more than a half mile long. Mountain Laurel Handrails blur the lines between the built and natural environments and make you feel like you’re part of the scene around you! We take pride in our work and treat every project as if we were building it for our family or loved ones. Want to create an outdoor entertainment space around your home or business? Add wood railing to your deck or patio to give you your own stylish backyard oasis. Contact us as so as possible so that we can get started putting your vision on paper. In no time we can turn your dream into reality.